Food historians generally agree the genesis of yogurt and other fermented milk products was discovered accidentally by Neolithic peoples living in Central Asia. These foods occured naturally due to local climate and primative storage methods. About milk. Yogurt has long been associated with good health and long life. Yogurt became popular in America after WWII. 2012, Debo, Christine's Pantry. All rights reserved. Place yogurt in a strainer lined with a paper towel and set the strainer over a bowl. Let the yogurt drain and thicken overnight. In a bowl, combine all ingredients. Stir well. Chill until ready to serve. Serve with chips, carrots or celery. Enjoy! Sounds yummy Christine. I totally love dips made with yogurt! And anything that has green onions has my vote. Buzzed! I make a lot of dips this sounds quite similar to the one I do but I do not drain the yoghurt, great idea, I also usually add pimento. Wow! Thanks for all that info. Garlic powder is an excellent addition to the dip. I love using yogurt to make dips, thanks! I love all those yogurt dips! looks great! Very yummy. I love yogurt dips! I like how thick and creamy this looks. I make my own Greek yogurt. This looks like a terrific use for it! This dip sounds like Tzatziki without cucumber! I'm sure it's delicious! I love yogurt dips but never tried to match it with green onions! I will have to remember this! Thank you, Christine! I love that this is light and healthy--just the kind of snack I need right now. 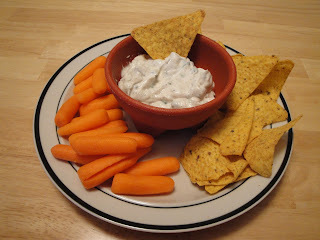 Yogurt dip are marvelous goes well with everything, love it! Thanks everyone! I love hearing from you. I love reading about fermented foods. I think they are very healthy. I try to eat yogurts and other cultured things and I love dip!!! Awesome info, Christine! I love yogurt dip...and this recipe of yours is just perfect! Do you have a cookbook? If yes, how much is your cookbook? Where do I buy your cookbook? I love your recipe, so easy and tasty. Perfect for a busy mom. Green onions, chives and yogurt, sounds delicious to me-great recipe! Yum! Great snack for the big game this weekend.